Daniel Kann and Jason Roos represent the future of Valbridge. They are among the highest-quality appraisal experts I’ve encountered. I’m proud of their success. There’s a new generation of leadership at Overland Park-based Valbridge Property Advisors (VPA), the nation’s largest independent commercial real estate valuation firm. Valbridge President Laird Goldsborough announces the promotion of Daniel Kann and Jason Roos to managing directors. Together, they’ll head up Valbridge’s (formerly Shaner Appraisals) Overland Park office under the continued tutelage of Goldsborough and Bernie Shaner, founder and industry pioneer. Kann and Roos joined the firm in 2007. They will continue to consult with and learn from both Goldsborough and Shaner, who are still active in the Kansas City practice that serves four states: Kansas, Missouri, Nebraska and Iowa. Shaner founded Shaner Appraisals 40 years ago on March 1, 1978. Goldsborough purchased the firm from Shaner in 2004. Under Goldsborough’s leadership, Shaner Appraisals joined 42 other appraisal companies throughout the country in 2013 to form a new company, Valbridge Property Advisors. In March, Valbridge will celebrate its 5th anniversary. In this time, VPA has grown nationally from 58 to 70 offices and added 100 employees for a total of 700 staff. The number of appraisers with the esteemed Member Appraisal Institute (MAI) designation has increased from 150 to 200. Locally, Goldsborough has doubled his staff and has enjoyed average double-digit growth since 2009. The company now employs 17 commercial real estate appraisal professionals, including six MAIs and 11 certified general appraisers, underscoring Goldsborough’s commitment to professional development. In addition, the company’s customer count is up more than 20% in the last five years and, most importantly, revenue per customer is up significantly as well. Clients of Goldsborough’s firm – and every other Valbridge office in the country – benefit from the best practices of a nationwide network of experts in the field. While each office operates independently, Valbridge acts as one company leveraging the knowledge of 45 entrepreneurs in 70 offices across the county to “build a better mousetrap,” as Goldsborough puts it. In addition to best practice sharing, VPA continues to push the boundaries of technology to ensure nationwide quality service. Datappraise, the company’s proprietary national database for commercial real estate appraisers, is key to VPA’s success. VPA purchased the software company, and Goldsborough – a 2014 Helzberg Entrepreneurial Mentoring Program graduate – initially served as chairman of the Datappraise board. job management systems that enable the firm to work on large, national portfolios of properties across multiple offices simultaneously. In the pipeline are new business intelligence systems with natural language processing to accelerate completion of client deliverables. 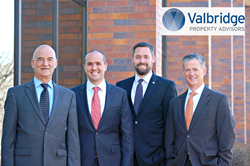 Valbridge Property Advisors, based in Overland Park, Kansas, proudly serves the Kansas City market as well as the surrounding states of Missouri, Kansas, Nebraska and Iowa.